What is the Digital Experience Score? 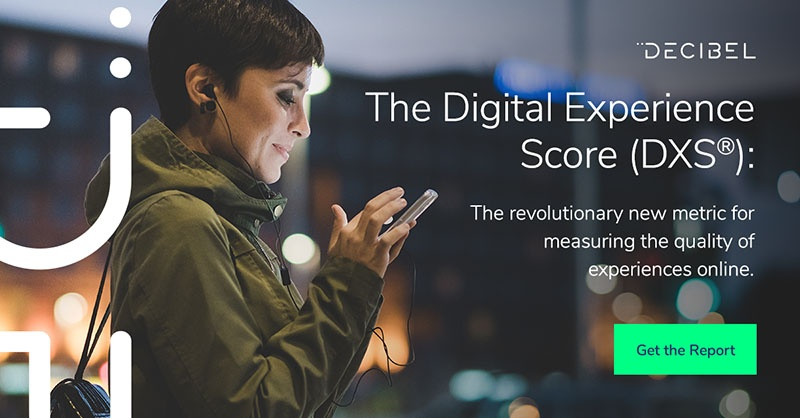 The Digital Experience Score (DXS®) is the world’s first all-encompassing metric for objectively measuring customer experience on websites, web applications, and native apps. Developed by Decibel, DXS grants immediate insight into the overall quality of experiences on digital properties. Powered by machine-learning, Decibel’s proprietary algorithms process hundreds of smart new digital interaction metrics – purpose built to measure experience online – and automatically calculate an experience score for every visit to your website or app. DXS® is based on five pillars of digital experience: navigation, engagement, frustration, technical, and form experience. You can access DXS® reports on individual sessions, pages or the entire website or app, meaning you have full visibility into digital experience improvement opportunities at every level. The diagram above demonstrates the way in which each experience pillar is built. Decibel’s Digital Experience Intelligence Platform collects experience data including clicks, mouse movements, hovers, scrolling, device rotations and more. All the while, it associates the behaviors with the underlying context of the content being viewed. Moving a level up, the data is processed into smart experience metrics based on categories including distance, velocity, movement, focus, and hesitation. This enriched data then feeds Decibel’s behavior detection algorithms and the platform automatically alerts teams to specific user actions that indicate the visitor’s state of mind – frustration, engagement or confusion. The scores within each of these experience pillars come together to create your overall DXS®. Why is the Digital Experience Score important? Until now, monitoring digital experience has been a challenging undertaking as all the measurements used have been qualitative and subjective. Digital teams have had to sift through dozens of reports or maintain custom KPIs to track the quality of experiences, and opportunities for improvement have been difficult to identify. With DXS®, they have a go-to universal metric that can be segmented across their entire offering and audience for immediate insight into where the biggest wins lie – all without having to ask customers a single question. DXS® updates in real time, so you can see in an instant whether or not your digital experience optimization strategy is having an effect on your customers’ experience as the data comes in. To learn more about how DXS® can help you identify opportunities for designing remarkable customer experiences, download the complete guide below.